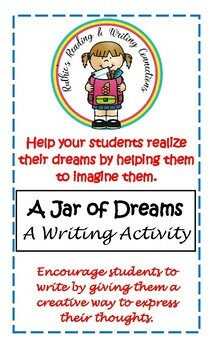 I designed this writing activity as a companion piece for a novel unit I usually teach each year, A Jar of Dreams by Yoshiko Uchida. I chose to teach this book because of its basic premise – wanting to fit in and be like everyone else. This is so important to upper elementary school students. This book also has another theme – that of accepting other races as well as you do your own. It is the story of Rinko, an eleven year old girl living in California, who desperately wants to fit in and be like everyone else. Instead, she is made fun of and made to feel different because she is Japanese. Eventually, her Aunt Waka comes for a visit from Japan. She teaches Rinko the importance of her Japanese heritage and the value of her own strengths and dreams. I have also used this writing activity as a beginning of the year project. These pages help me to learn about my students, as well as get to know their writing strengths and weaknesses. There are five writing activities in this project. First, I make copies of the pages for each student on legal size paper. Next, we cut out each jar. I let those students who have no difficulty in cutting do their own cutting. For those who struggle with cutting, I will cut these out myself. The students should have a good set of 5-inch scissors. Then, I staple each set of jars, putting in three staples at the top of the jars. We begin the project the next day. To begin this writing activity, I ask my students to imagine a career that they would like to pursue. I give them a blank sheet of paper on which to draw themselves in this career (e.g. 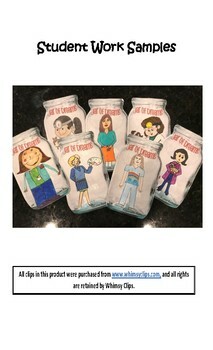 a nurse, a pilot, a lawyer, doctor, beautician, etc.). I have them first draw their picture on blank paper and when they’ve made their corrections, I tell them to trace the picture on the jar itself. Finally, have the students color their pictures. Outline each drawing with a thin black marker. 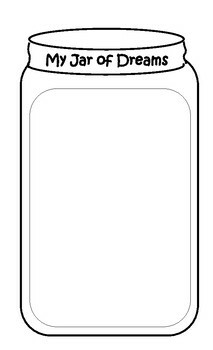 Cut the pictures out and glue on jar. 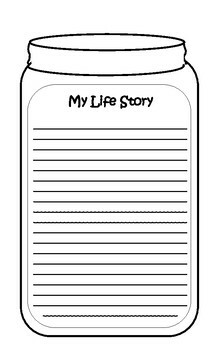 My Life Story – On this page, have the students tell you about their lives. Include such things as their birth and important milestones in their lives. Include things they like to do. My Family – On this page, have the students tell you about their parents and their brothers and sisters. They can also include any family traditions that they would like to share. My Dream Career – Once they have chosen their careers, have them describe their choice and why they have chosen it. Education will be important to my dream – Have them explain what role education will play in achieving their dreams. For example, will science, art, or math be important? It might be necessary for the students to do some quick research on the topic of their careers before they write. My Secret Dream – We all have secret dreams. Perhaps, we might want to go to another country or see the Grand Canyon or own our own homes. What is your secret dream?